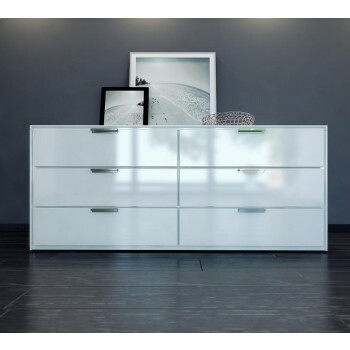 The Thompson six-drawer split dresser with chrome handles matches any contemporary bedroom decor. A routed front panel frame adds a stunning element of design. Italian Danco-brand soft-closing hardware enables smooth and effortless drawer movement. Interior of drawers elegantly lined in light beige linenboard.